the bathwater is freezing on the floor. heads, blowing enraged into the night. steam, into extremely simple fog. along the mane of the frozen horse. I met Ferenc aka Feri at the FISZ-tábor 2017 Poetry Camp in Visegrád, about an hour outside of Budapest on a verdant, castle-topped mountain tucked in a bend in the Danube. Juana Adcock and I were there representing Scotland at the invitation of the brilliant poet and translator Balázs Szőllőssy. Our role was to participate in the translation residency programme that accompanies prose, poetry and translation workshops throughout the week. The motivation of the young people who run FISZ, a vibrant organisation responsible for publishing new poets and infusing energy and intention into a literary community under the shadow of an oppressive political regime, was an inspiration. 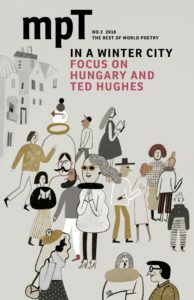 We spent our days with our partnered poets: reading, discussing and translating one another’s work from English originals (written by Juana and myself) and English cribs (created by the Hungarians). Feri has a very original language for expressing himself and his poems are both metaphysical and personal in a way that unsettles and moves me. When I asked him to talk more about this poem, he spoke of Nietzsche crying out at the cart driver who was beating a fallen horse in the cold, of the philosopher running to embrace the horse’s enormous head and neck and weeping in the street.